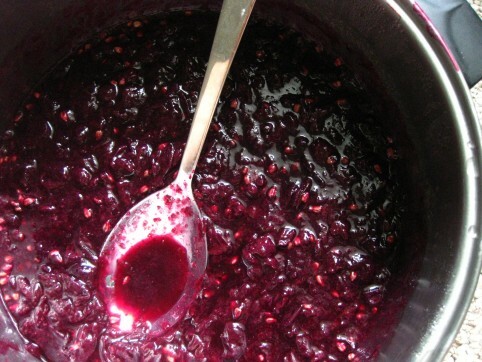 The Herbangardener » Incredible Homemade Wild Grape Freezer Jam — Sugar-free & Pectin-free! 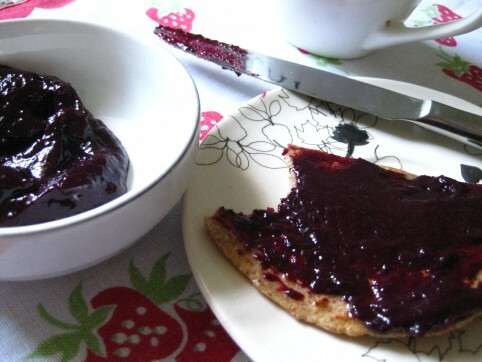 Incredible Homemade Wild Grape Freezer Jam — Sugar-free & Pectin-free! 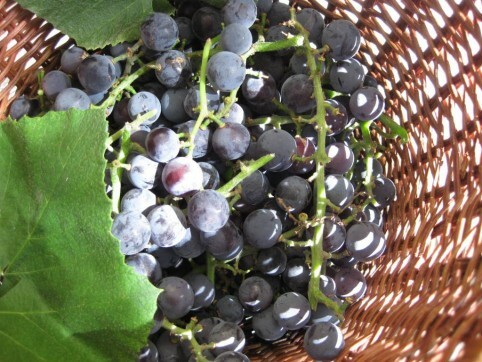 Finally, here’s my recipe for the best wild (or “Concord”) grape jam ever! The flavor really is incredible. I’m not a big jam-maker normally. And maybe that’s because nobody ever told me that jam doesn’t have to be complicated, the way most publications make it seem. This is the easiest jam you’ll probably ever make…because I discovered by accident that you don’t need either sugar or pectin to make it! And because it’s “freezer jam” (meaning you store it in the freezer), you won’t be sterilizing jars or canning anything. You’ll just be cooking the grapes way down, allowing the natural sugar and pectin that’s already in the fruit to do the job for you. (To give you an idea of how much jam you’ll get, 9 lbs of grapes yields about 1 quart of jam.) Then, you eat it! And if you’re going to keep it around for a while, just pop it into the freezer to extend its life. 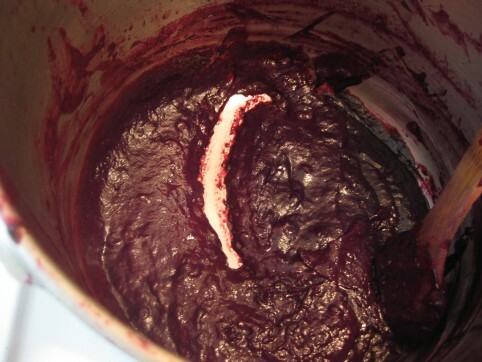 This jam is also what I use to make my delicious Concord Grape Fruit Leather. Try it sometime! 1. De-stem & wash your grapes. 2. Put them into a large pot, and turn to medium-low heat. No need to add any water to the pot — they’ll provide plenty as they heat up and burst. Stir frequently to prevent burning at the bottom, and to get all the grapes heated up. 3. Cook, uncovered, stirring frequently, until most grapes have burst. The unripe ones won’t burst. 4. Turn heat down to low, and simmer, uncovered, until the grapes have cooked down a bit. Turn off the heat and let the grape slurry cool off a bit until it’s handle-able. 5. Strain your slurry through a mesh sieve with holes just small enough to prevent the seeds from going through. A food mill can also be used here; I bought a $30 Italian-made one from Crate & Barrel several years ago to use for this purpose. When it broke, I was actually sort of glad. 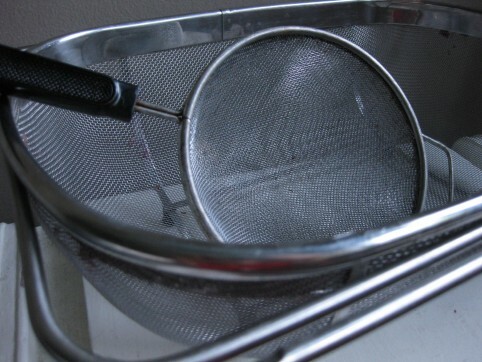 I went right back to using the circular sieve pictured below, and this continues to be my tool of choice — it seems quicker and more direct, and the irritation of seeds jamming up the mill is not there. I prefer it. This is the most labor-intensive part of the whole process because you’ll really want to stir a lot and press the pulp firmly against the sides of the sieve to separate all the liquid from the seeds and skins that will be left behind. Really scrape the pulp against the sieve so that you get some of the pulp pushed through the holes into the juice. This seems to help the jam thicken up. This is also a time when you could use a blender. 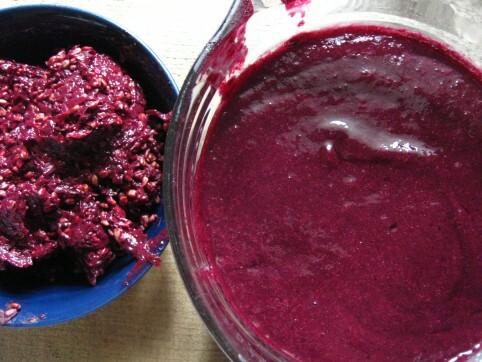 Before pouring the grape slurry into your sieve, pulse it several times in your blender, then pour it into the sieve. You don’t want to blend up the seeds, but the blender does help break up the grapes and pulp, making it easier to strain. After most of the juice is strained out of each batch of pulp in the sieve, I like to put the spoon down and get my hand in there to squeeze the rest of the juice out of the pulp-and-seeds. Once this process is complete, you’ll have plenty of soupy liquid and the pile of seeds & skins will be surprisingly small. Strain your grape slurry through a metal sieve. The large one is nice for big batches, but the small one is my favorite, and what I use even for large batches. Strained liquid on the right, ready to cook down into jam. The skins & seeds are on the left, ready to be tossed. You know it’s done when your spoon track doesn’t fill back in. 7. That’s it! Cool & store in the fridge (it’ll last a couple weeks before starting to go moldy), or in the freezer for long-term storage. You can also can this using the water bath canning method. I have been canning this grape jam for the past several years and it is my preferred storage method. It does, however, tend to crystallize for me (must be the sugars) when it’s canned. I don’t mind, but if you don’t want that, you may just want to keep it in the freezer. So far I have cooked down the grapes for 3 hours and it is still runny…it tastes amazing but it won’t set up. Any suggestions? I did start with 12.5 pounds of fresh jelly/concord grapes. Just made this jam and as it was finishing smelled super caramelly. Placed it in the jar and in the fridge – when I went to taste it, it was hard as a rock :(. Any ideas as to why. Did I overcook it? I even pulled it off the stove before the spoon track “didn’t fill back in”. Maybe I cooked it on too high of heat – though it was at a very low simmer. I am going to try and turn it into fruit leather – but really bummed as I wanted jam! I picked 16lbs of grapes on Friday night, cleaned them, then cooked and strained them before putting the juice/slurry in fridge in an air tight container. Today (Sunday) I put it all in a pot to boil down (that took *forever*). I could tell that the grapes were going to be *sour* so I added 1.5 cups of sugar. Now that it has cooled down, I know that it could have used a whole lot more. I’ll be trying the leather, but in an effort to cut the sour some, I’ll be mixing some of the grape with apple/pear. Just to give an idea of yield, from 16lbs of grapes, I got roughly 5 250ml jars. Of course! The process would be a lot easier if you left it all intact. The thing that the strainer or food mill does, though, is strain seeds out and at the same time grind up the skins so that they go into the jam itself. After straining or milling, you’re left mainly with seeds. Most of the skins will be in the finished product. I’d recommend straining or milling it to strain out seeds and break up skins into minute bits, but any way you eat it, it’ll be good. I was very interested in this recipe as my husband is diabetic.I prepared the recipe according but found it a bit too sour. I added a regular size box of sugar free raspberry Jello which added just the right touch of sweetness and did not alter the taste of the grapes at all. Perfect!! I am making it now. It has gotten amazingly sweet without any sugar. I can’t believe hie good it is. I’m eating it right out if the pot! How many grapes do you put in it? Kevin, it’s up to you. 9 lbs of grapes equals about a quart of jam once cooked down. I made my first batch of freezer jam. I was afraid that it wasn’t any good because I am used to people telling me (who do shelf life canning), that the jars need to be sterilized and I have always heard and seen recipes for way more sugar to help keep bacteria away. I didn’t put alot of sugar in my first batch, but some. I realize now, I hope, that I don’t need the sugar, or as much in the freezer jam. I seen someone asking about the seeds. I do not have a grinder to see if it would make the seeds smaller or even into a powder, but I know that they have a lot of great nutritional benefits. I put the seeds in a ziploc bag and put them on the table. I pushed hard on the top rolling with the rolling pin. I kept pushing the seeds back towards the bottom and rolling again. The seeds were not powdery but they were crushed up a bit. If you swallow the seeds whole they go right through your system. But if you crunch them up or chew them, you get the nutritional benefits of the seeds, like antioxidants. I took some of the crunched up seeds and put a little in 3 of the jars and stirred them up. Did not seem to affect the consitancy, I did use sugar and pectin though because it was the first time I have ever made jam, and that’s what the directions were in the recipe I was following. Tasted great with and without the seeds and way better then the store bought “grape” which I don’t like very much. Hi! My boyfriend and I used these guidelines to make jam out of the concord grapes that grow on our property. It worked perfect! End result was exactly the same consistency as regular store bought jam! It did take like 6 hours to cook down, but I wasn’t bothered by that. Just did oher things and checked on it once in awhile, gave it a quick stir. We started with 15 lbs, but cut it down into smaller batches. The smaller pots finished a lot faster. It was pretty tart, but I like it. I could see how a lot of people would want to add sugar. I didn’t and I love the intense grape flavor, but even if you do add sugar it’s still a great method, because you can add so much less than most recipes call for. Thank you for posting! Oh I also meant to say, I made a jar on October 1st, it only now (early December) has started showing signs of mold. So keeps well in the fridge too! Monique, Awesome! I’m glad it worked for you. What I’ve learned is to let the grapes get really really nice and ripe on the vine if possible (and not threatened by wildlife which means then you’d have to pick earlier than preferred). I like tart stuff but totally understand adding sugar if it’s just too sour to get through! And yes – it’s quite slow to mold in the fridge, I’ve also observed! Nice huh. Emily I’m glad the food mill is saving time!! I bought a food mill once, $30 from Crate & Barrel and it seemed to do fine. However it eventually broke and I went back to using the old strainer method and I must say I preferred the strainer. So I never replaced the broken food mill! Yours may be a better design though. With mine the seeds were always jamming the thing up. Reading this, I realize everyone does it differently. After washing my grapes I puree them whole and then strain twice through a colander, mashing down. Gets me a nice thick puree for jam wth tiny bits of the skin and seeds for nutritional value. Then I just put in my pan with the correct amount of pectin and sugar and cook, pack my jars and 15 min in my hot water bath canner. Best jam ever-not real chunky but not clear like jelly. My freezer jam didn’t thicken to the consistency of what it should be. I cooked it for many hours on low. Should I add some pectin before putting it in jars and freezing it? I wonder if you could put it all in a high powered blender — rather than the sieve or the food mill. I put grapes in smoothies all the time, but I’ve never used seed grapes. Just made this recipe with the Concord grapes that grow in our back yard! The neighbor planted a vine for us a a few years ago and we now have a ton of grapes. It’s so delicious on toast with soy nut butter. We loved the tart taste – no sugar needed. Thanks for inspiring us! Hi Raea, Yes, either continue to cook down, or add pectin if you’ve had enough of the cooking and just want to move on! 🙂 Good luck. Betty, this would be a good experiment. We have seed grapes this year; I may try some in my Vitamix after cooking, and see if it purees the seeds enough. Let me know if you try it. Thanks for reporting on your success; am always happy to hear it. There is a product called Ultra Gel. It can be used in place of pectin. It thickens anything, can be added to hot or cold mixtures. I just love it. 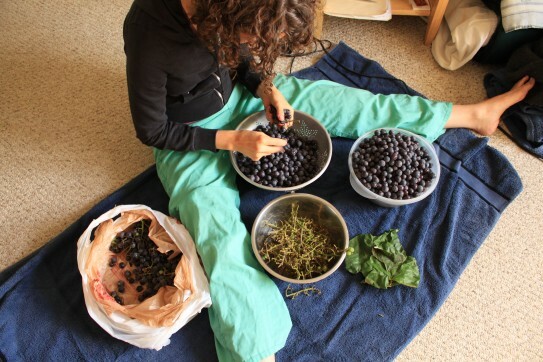 Betty, a few years ago I tried using a high powered juicer to process Concord grapes into juice, including the whole fruit seeds and all. I canned the juice, using little sugar. The result was a very strong tasting juice with a texture that was not completely smooth. It was very concentrated, and even after adding water to tame it down a bit, it still wasn’t pleasant. I was very disappointed and haven’t tried it since. 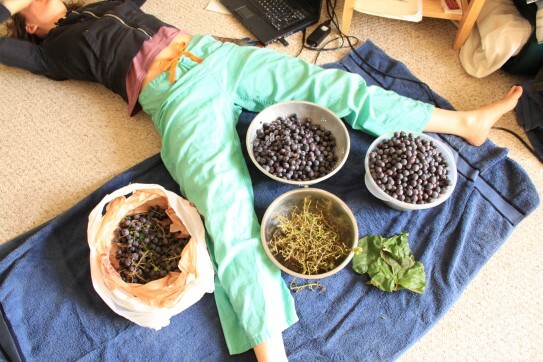 I am in the process of making a TON of grape jam. My grapes were pretty sour so I have added quite a bit of sugar. I’ve been cooking it down for quite a while. Still runny! I’m having an issue with my jam. It is starting to smell and taste like prunes. Have you had this issue before?? Please help!! It may actually work even if still runny. I have been making jam too, and stopped cooking mine while runnier than I used to. It set up nicely in the fridge. I have not had the prune issue before. If you’ve cooked it down by about 2/3 of the original volume of the strained juice-pulp, then try taking it off heat, letting it cool, and putting it in the fridge to see if it sets up and if the taste changes once it has cooled down. If it’s still runny you may need to keep cooking it down further, or add pectin. Good luck! I’m sorry I can’t be of more help here. I read somewhere that I shouldn’t have made such a big batch. I had so many grapes on a vine right outside of my house. I’m not sure what to do, but it does not taste like grapes anymore. I might end up tossing it all. Just made this today. It turned out perfectly! My daughter said it tastes “just like store bought, but somehow better.”. We used about 7-8 lbs of nearly over-ripe concord grapes from a friends vineyard. The ones that were so ripe the pickers left them behind. The resulting jelly is perfect. Just the right flavor and texture and none of the additives. Had they been store bought or less ripe, I can see where you might need to add a little sugar, but the over-ripe grapes were perfectly sweet. I used a potato masher when cooking down the grapes then a mesh sieve to strain them after the mix cooled, pushing it through with my fingers. I ended up with 3 235ml bowls full. Thanks for this recipe. YES! Awesome, and you’re quite right – the overripe grapes are perfect. You do have to leave grapes on the vine till after it seems too long, for the sugars to really come up. So glad you’ve had success; isn’t it delicious stuff?! Thank you for your feedback! I’ve recently made some with very ripe grapes and goodness it’s almost too sweet. ! I think the people leaving the seeds in should goggle -grape seeds=cyanide -a build op of toxins is not what you want . I just found this today and am so excited to try this and the fruit leather. First year I had grapes I had a bumper crop and made jelly, with the sugar and pectin, and canned. second and third year grapes were not good, as I did not know how to trim the vine in the winter. I learned and this year another great crop. I love the flavor of these grapes, grew up in an area that they were in the local grocery store, as a child we ate these a lot at the end of summer when they were in season. Squeezing the grape into your mouth, swallowing it hole and squeezing the juice out of the skin, and then toss the skin aside. I’ll let you know how it goes.